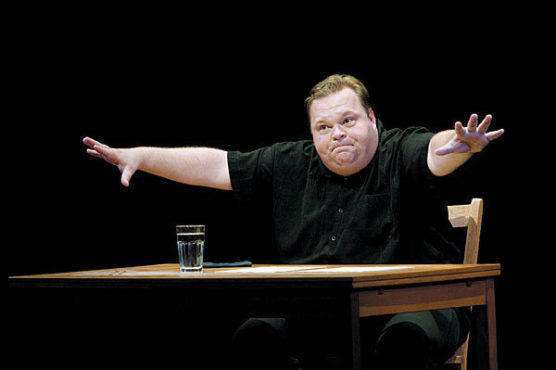 The monologuist Mike Daisey has a masterful command of his art. Sitting alone at a simple desk, he is all-powerful for 100 minutes. When he wants you to laugh, you laugh; when he wants you to think, you think. Often, he can even get you to do both of these things at once. This is certainly the case in his latest project, If You See Something Say Something, in which the storyteller deftly weaves together disparate strands of narrative—about national security, personal insecurity, the military-industrial complex and the nuclear test site at the unholy Trinity, New Mexico—into one of his characteristically complex Daisey chains. Daisey is a heavy man, prone to profuse sweating, with a frowny face that suggests a perpetual state of mild dismay; his generally thoughtful, probing manner sometimes flares into Lewis Black–style outrage. He is at all times exactly himself, yet in subtle ways, he winds up speaking for everyone. His delivery seems so spontaneous that you hardly notice how elegantly the show is structured, and he is so personable that even his counterintuitive points come off like common sense. The mix of personal and political in Daisey’s work puts him squarely in the Spalding Gray zone, but there is also a hint of Wallace Shawn in his sly subversiveness. He doesn’t draw you into the stories he tells—not exactly. Rather, he shows how, perhaps unawares, you have been part of them all along. Joe’s Pub. By Mike Daisey. Dir. Jean-Michele Gregory. With Daisey. 1hr 40mins. No intermission.